Aaron Kleiber has been entertaining his entire life — from climbing atop his grandmother’s coffee table as a child, being voted class clown in high school, to taking the stage at comedy clubs across North America today.On the strength of his energizing, crowd-pleasing live performances, Aaron Kleiber emerged as one of the most in-demand feature acts in stand-up - touring alongside Bob Saget, Jim Breuer, Bert Kreischer, John Witherspoon, Josh Blue and Steve-O. Also seen on the #Deathsquad tour with Doug Benson, Tom Segura, Tony Hinchcliffe & Brian Redban and has made multiple (winning) appearances on the top rated podcast "Doug Loves Movies" with Doug Benson. He’s also had the privilege to open for comedy greats like Billy Gardell, Emo Phillips, Bobcat Goldthwait - and one of his comedy idols, Sinbad. 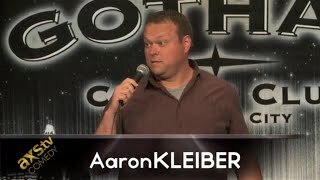 Now, Aaron Kleiber is breaking out as a bonafide headliner himself at clubs and colleges across the United States and Canada.As a standup comic, Kleiber made his nationally-televised stand-up debut on AXS Tv's 'Gotham Comedy Live' in 2013 (in which his set was used as part of it's 'Best of Season 2' episode) - shortly thereafter made his second on 'Standup and Deliver' on NUVO Tv, filmed live during the Cabo Comedy Festival in 2013. Named a top 5 finalist in the 2014 Big Sky Comedy Festival, judged by the biggest names in the comedy industry (Just for Laughs, CBS, SXSW, Comedy Central). Aaron was also was named “Best Local Comedian” by Pittsburgh Magazine in 2012 and 2013.As an accomplished comedic actor, Aaron can be seen in a guest-starring role for the Nickelodeon series 'Supah Ninjas.' He co-starred in the film 'Help Me, Help You' opposite Sabrina Bryan (The Cheetah Girls, Dancing with the Stars), appeared in the acclaimed drama, 'Warrior,' starring Tom Hardy and Nick Nolte, for Lionsgate, featured in the original series The Mercury Men, seen on the Syfy Channel- along with appearing in dozens of national/regional commercials. Currently seen as the face of the Pennsylvania Lottery as President Grover Cleveland. Aaron was known early in his career for producing, writing and acting in both, the groundbreaking independent film (and subsequent Web series) Captain Blasto as well as the beloved Star Wars mockumentary, 'A Great Disturbance,' both of which claimed multiple awards and fans at film festivals and fan fests nationwide. Aaron studied improv comedy and writing at the legendary Second City in Chicago.A native of historical steel-town, Pittsburgh, Pennsylvania, and a fixture in the city's now vibrant comedy scene, producing multiple shows monthly - the weekly 'Comedy Sauce' showcase (the longest running comedy show in Pittsburgh) and 'Comic Wars,' an original standup comedy gameshow pitting comedians against each other at Arcade Comedy Theater (serves as Standup Programmer and Leaderboard Member).